The Woolhope Dome is a unique area for its geology and mix of habitat types and has been designated as one of the West Midlands Biodiversity Enhancement Areas. Award winning Mabley Farm lies at the heart of the Woolhope Dome, close to the village of Woolhope and within the the Wye Valley AONB. The glorious countryside and peaceful surroundings of the area belies the fact that the historic City of Hereford, as well as the market towns of Ross-on-Wye and Ledbury are all within easy reach. The village of Woolhope is surrounded by wooded hills, orchards, meadows and streams with numerous footpaths (our woodland borders the Wye Valley Walk) and quiet lanes for cycling. The village has two pubs which serve delicious, locally sourced food. 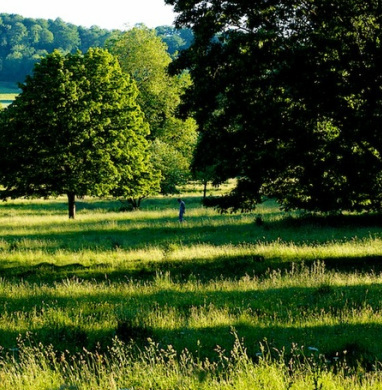 On the farm we manage wildflower meadows, parkland and woodland for wildlife conservation, landscape enhancement and environmental education. Our pedigree Longhorn cattle and Wiltshire Horn sheep provide organic beef, lamb and mutton. The woodland produces timber for firewood, charcoal, the construction industry (via local sawmills) and the restoration of old buildings. Coppiced hazel provides material for wattle fencing and hedgelaying.